Give your customers a taste of what you’re all about with a high quality bottle of Prosecco elegantly wrapped in your brand imagery. 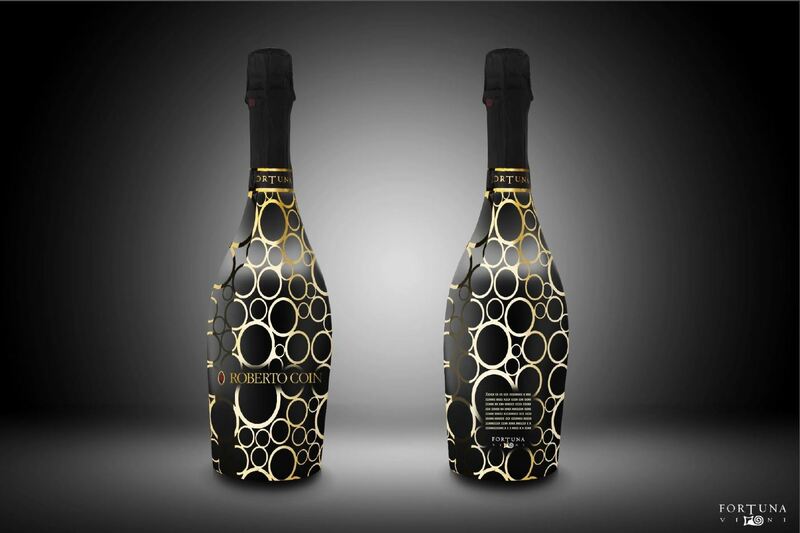 This is a high quality DOCG Prosecco Valdobbiadene Superiore wrapped in the brand of one of the world’s leading luxury jewellery brands – Roberto Coin. With a minimum order of only 1,000 bottles you too can have your own Prosecco brand for corporate hospitality, corporate gifts, special events, to celebrate your personal celebrity status or perhaps even to sell to consumers or trade customers as a lucrative extension of your brand. These are Premium bottles, therefore they attract a premium price, however at these low volumes the prices are still very reasonable. 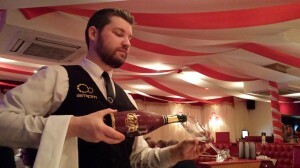 It is unusual to be able to be able to personalise a wine bottle at volumes lower than 10,000 units, but Prosecco specialist importer GreatVine is the first to make fully personalised bottles of high quality Prosecco DOC Treviso Millesimato or DOCG Valdobbiadene Superiore available anywhere in the UK or Ireland from a minimum order volume as low as only 1,000 units with very affordable pricing. In fact the 1,000 minimum order requirement can be split up into two orders of 500 bottles as long as the total amount of 1,000 is delivered within one year. The entire bottle can be designed to the client’s specification and 2-3 initial design proposals are included within the price. The branding can go way beyond just the label, to a complete sleeve design and stunning mirrored finish options or accents of gold leaf. A new type of print technology enables bottle effects that reach far beyond traditional digital printing techniques, but this technology is exclusive to GreatVine in the wine sector. The branded bottles are proving popular with corporate brands as well as hospitality brands and are especially popular for branding major events. Luxury Jewellery brand Roberto Coin wrapped the design for their Bollicine Collection, which aptly translates to ’Bubbles’ in English, for use at the world’s largest luxury jewellery & watch fair in Basel Switzerland, where it was served to their customers and media guests. Baglioni Hotel group now have their own slick black bottle of branded Prosecco throughout their prestigious venues, and the Cabaret Supper Club in Belfast ordered a glitzy Cabaret styled red and gold bottle featuring a showgirl and Chandeliers which has proved extremely popular with their customers. 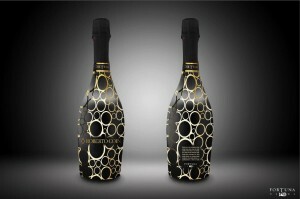 The concept of a luxurious branded bottle containing one of the most popular beverages in the UK market, also offers a brand extension opportunity for example to brands in the fashion industry, that could benefit from distributing their own branded Prosecco bottles nationwide thereby putting their brand values directly into the hands and mouths (so to speak) of their target consumers. Catering and event management companies pitching for large events, could also ensure they have the competitive edge by offering branded bottles for their client events. So give your customers a taste of what you’re all about with a high quality bottle of Prosecco elegantly wrapped in your brand imagery. Want to bottle your brand? 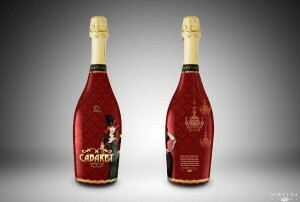 Email orders@greatvineagency.com and we’ll be happy to propose fantastic 3D rendered designs for your dream bottle. We are the go to supplier for Premium quality Artisan hand made, single vineyard Prosecco in the Irish Market. We also supply a range of fantastic Artisan wines from many countries and supply entire wine lists. Always sourced directly from small to medium Vineyards, never from wholesalers so our prices are extremely competitive. Request a copy of our latest Wine Portfolio now! RT @ILoveHillaryC: @jdawsey1 @PostRoz @costareports Innocent people don’t do this.